BEAR STORIES AND MORE : To hear stories from the week as told by the teens, click here. This page was created by the campers using the pictures they took and the stories they wrote. 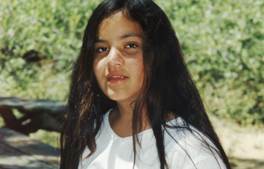 The workshop was called: "It's your web page, you get to choose"
Update: Follow-up Camp Whittier happened August 23-27, 1999. 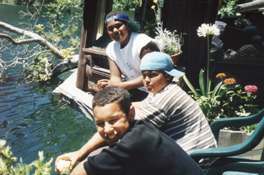 See new Camp Whittier page and recent press release. For five days and nights last summer, magic happened at Zaca Lake Camp when a group of 50 at-risk teens from Los Angeles to Santa Barbara, were transported from their challenging everyday existence to a beautiful setting in nature where for many, personal transformation took place. The camp, sponsored by the Us Foundation was a gift to these teens whose lives are rarely exposed to immersion in nature for an extended time and the many workshops and activities they were invited to choose from. The theme of the camp, "it's your life, you get to choose" empowered these young adults to take responsibility for their lives through the choices they made. 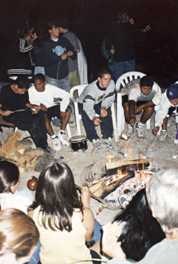 When they arrived, each camper was assigned to a group of seven or eight campers with an adult leader, and each group was given a totem animal name, e.g. snake, mountain lion, dolphin, whale, etc. Tee shirts depicting these animals were distributed to each group who shared meals together, providing the campers with the opportunity to meet and get to know each other. Each group assisted with meal preparation and clean up and, in so doing, contributed to the positive experience of all. 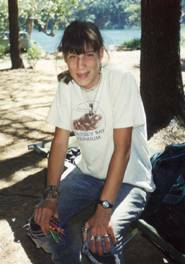 The campers helped to create the boundaries of their experience such as one person speaking at a time in a group, respecting nature and each other and designing consequences if fellow campers chose to disregard these agreements. Campers were occupied day and night with a myriad of activities, from personal growth, art, dance, video, workshops to boating and swimming in the lake, followed by a variety of wonderful evening activities. After lunch each day, the lake became the central focus of activity, with swimming, boating, canoeing, kayaking, paddle boarding, or just hanging out on the float with one’s friends. Other popular afternoon activities were creating beautiful mandalas, walking a labyrinth, or receiving and giving massages. After dinner events included storytelling, our own "KZAC Evening News" featuring interviews with campers and counselors conducted by a camper reporter and cameraman, guest speakers who spoke on whales and dolphins, astronomy and meteors. On the last evening a theater performance, developed over the five days, was presented which contained both humor and truth, followed by a dance party facilitated by a Santa Barbara DJ playing music which lasted until midnight. The campers reported a week of deeply rewarding and enriching experiences that they carried back to their homes. They learned a lot about themselves, how to get along with others, being appreciated by a loving staff and about the beauty and nurturing qualities of living in nature. They learned there is more to life than watching it go by on television. They learned teamwork. Most of all they experienced the generosity and unconditional love of all who came to present for them. 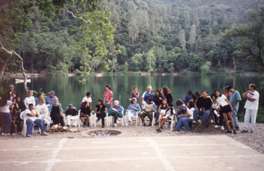 The campers relaxed into the beauty of Zaca Lake and all the camp had to offer. Attitudes changed, stamina increased (long hikes and lake activities), and fears of trying out something new and risking their "image" dissolved over the five days. In addition, the campers felt like they really made a difference and many had a true sense of self-esteem for the first time in their lives. And what about next year? Well, the Zaca Lake Camp will be back, better than ever, enhanced by our first learning experience together as campers and counselors. 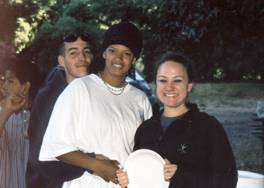 And if Smokes and Jessica, two teen leaders, keep their commitment to getting off probation and learning to be junior counselors, they will be back to help their peers be responsible contributors to the fun and energy that is Zaca Lake Camp.